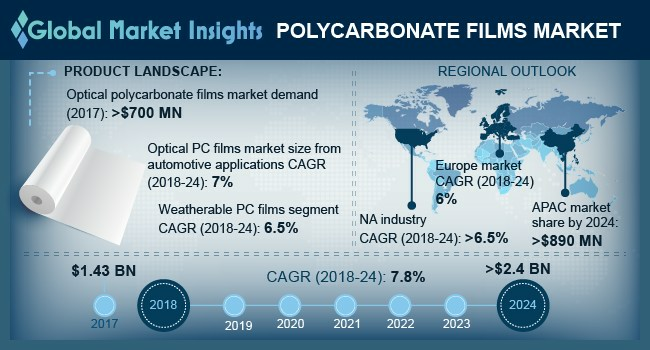 Polycarbonate Films Market size is set to surpass USD 2.4 billion by 2024; according to a new research report by Global Market Insights, Inc. Growing consumer demand for automotive sector to produce light weight cars and provide durability may drive polycarbonate films market demand. High strength, abrasion resistant and optical clarity characteristics may cater to electronics, construction and medical industries, thus propelling the industry growth during the forecast period. Polycarbonate films are recyclable and possess improved mechanical, electrical and thermal properties which makes it suitable for the usage in different end-use industries. Lightweight and energy efficient cars demand have been increased in recent years which are suitable for automotive application by enhancing stability, providing insulation and creep modulus, thus increasing the industry demand. Flame retardants polycarbonate films market demand from electrical & electronics applications may surpass consumption at 35 kilo tons by 2024. Increase in demand for electronics accessories and hardware appliances may boost the overall PC films market growth. The light-weight and high impact properties make them a promising material to be used for construction sensor parts, cell phones, connectors, switching relays and CD’s. Stringent government norms for using heavy materials like glass and metals in various industries may enhance the overall product demand. Industrial scale of manufacturing PC films is a high investment cost procedure owing to environmental factors, catalyst requirement and high processing temperature. Polyethylene terephthalate (PETG) is a substitute product with 70% impact strength and is cost-effective making it suitable for display units, factory machine guards, and impact resistant glazing. China weatherable PC films market demand may witness significant gains at over 8.5% during the forecast timeframe. China consumer electronics industry accounted for about 25% of the total market demand in 2017 due to increasing tablets, cell phones and LCD demand. Changing macroeconomics such as rising disposable income, education attainments and expanding population are the key factors for the growth of electronics market, which in turn drives the market growth. Germany polycarbonate films market demand is anticipated to surpass USD 130 million by 2024. Rising automotive production and favorable regulations are the major attributes for the growth of PC films market. Increasing technological advancement and strong focus towards R&D spending for high quality films has led to induce more product innovations and replace heavy materials such as metals and glass, thus driving the industry demand. Japan optical blend polycarbonate films market demand from household appliances may witness growth rate at around 8% from 2018-2024. They offer excellent resistance to abusive chemicals & cleaners, abrasion resistance, and pencil hardness which can be included in switch overlays & labels for household appliances. Standards set by government bodies along with developing new & innovative products and improving the current product portfolio in order to improve sustainability and reduce cost may favor polycarbonate films market growth in the country. Macdermid, Excelite, Wiman and GOEX are key industrial participants in polycarbonate films market. Strong R&D spending to cut down manufacturing cost and to fulfill various environmental regulations may enhance the product portfolio thereby stimulating the industry growth.